During much of his 50 years of priestly life and ministry in the Church in central and southern Indiana, retired Father Martin Peter has sought to apply the Gospel prophetically to driving social questions of the day. That might have been hard to foresee, though, when he grew up in the 1940s and 1950s, in Tell City, a faith-filled town along the Ohio River, but one which was relatively insulated from the broader world at the time. That began to change a little for him when he discerned a call to the priesthood as a teenager. But the early years of his priestly formation were spent just up the road from Tell City at the former Saint Meinrad High School and College. Change came quickly, though, during the last four years of Father Peter’s time in the seminary when he was a student at The Catholic University of America in Washington from 1963-67. Within months of his arrival, he and the rest of the nation were shocked at the assassination of President John F. Kennedy, the first Catholic to hold that office. He stood in line to view the president’s casket in the U.S. Capitol, and watched from a sidewalk as the funeral cortege made its way to Arlington National Cemetery. During his years in Washington, Father Peter also was formed for the priesthood by his participation in demonstrations for civil rights for African-Americans. His value of civil rights for all people that was instilled in the seminary was put into action in the early 1980s when he served as pastor of St. Thomas Aquinas Parish in Indianapolis. At the time, the nearby Riviera Club, a private recreational facility near the parish, did not accept African-Americans as members. Father Peter, members of the parish and other priests in the Indianapolis North Deanery led a successful effort that involved demonstrations and dialogue to have the club change its admission policy. St. Thomas parishioner Charles Williams, himself an African-American, took part in the effort and was encouraged by his pastor’s leadership. “It was so strengthening to know that you had some support,” Williams said. “Father Marty was integral in that in terms of getting the club opened. St. Thomas Aquinas was at the forefront of the marches and the whole process. 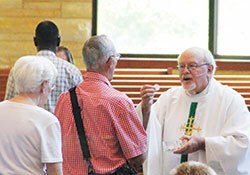 Putting faith into action in the way that Father Peter did when serving at St. Thomas and other archdiocesan faith communities sometimes put him at odds with some parishioners who had different views on how the Gospel should be applied to social issues. While Father Peter did not back away from the prophetic aspects of his priestly ministry, he also knew that he was called in his vocation to bring all the faithful together as one. “It’s a challenge to reconcile being both a prophet and a reconciler,” he said. “If a person doesn’t feel that tension, it may mean that we’ve sold out totally to one and ignored the other. And he saw much good happen in leading St. Thomas and, later, St. Malachy Parish in Brownsburg and St. Pius X Parish in Indianapolis. One of the good things that he promoted in parish ministry before he was granted early retirement in 2003 for health reasons was to promote increased lay participation in the Church’s ministry. He saw this as a way to implement the renewal of the Second Vatican Council. which, in viewing the Church as the people of God, opened the door to greater involvement by the laity in its ministry. In 1975, when he was co-pastor of St. Thomas with Father Joseph Dooley, now deceased, he hired Matt Hayes as one of the first lay directors of religious education in the archdiocese. Hayes currently serves in the archdiocese as project director of the Empowering Pastoral Leaders for Excellence in Parish Leadership and Management grant that it received in 2016 from Lilly Endowment, Inc.
Now living in rural Bartholomew County, Father Peter stays active in priestly ministry, assisting in more than 50 parishes across central and southern Indiana in his 14 years of retirement. Because of where he lives, he often serves parishes in Columbus, Edinburgh, Franklin, Nashville and Seymour. 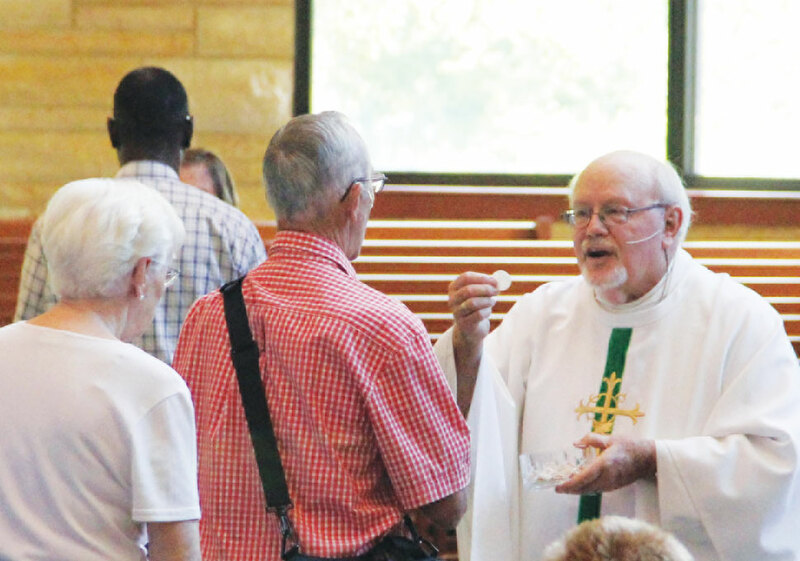 Father Peter enjoys focusing on what he calls “the heart of priestly ministry,” moments such as celebrating Mass, witnessing the exchange of wedding vows and burying the dead. And it’s in these moments that he encourages men who are considering the possibility of serving the Church to reflect that God might be calling them to priestly life and ministry. “So much of what I find wonderful about the priesthood is the opportunity to be with people in the greatest joys and sorrows of life,” Father Peter said. “You’re with them at baptisms and weddings, celebrations of joy, but also at funerals and times of grief and difficulties. It is one of the most fulfilling ways to be a part of people’s lives.